Slingo Supreme is the sequel to Slingo Deluxe that is packed with even more Sling-tastic fun. 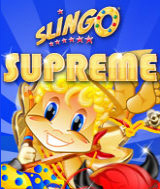 It features a new and innovated Supreme mode that lets you build over 16,000 different Slingo games. It also contains an infinite amount of Daily Challenges, new Power-ups like Reel Nudge and Instant Slingos, and introduces the long awaited Devil Mini-Games. Now you can finally take on that Devil and beat him at his own game. Comments: This is the least engaging Slingo yet. If you want excitement, this is NOT your game.